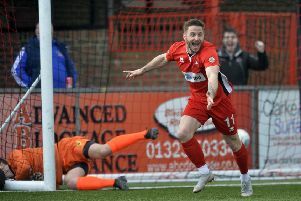 Striker Yemi Odubade looks set to depart as Eastbourne Borough prepare to welcome Billericay Town to Priory Lane this Saturday. Odubade, 34, has struggled to establish himself in the first team this season and is expected to seal a loan move to Bostik League South highflyers Weymouth in time for the weekend. New defensive loan signing from Dover, Manni Adebowale, missed Tuesday's Sussex Senior Cup win at Horsham with a slight back spasm. “Manni could have played but we didn’t want to risk him ahead of Billericay,” explained Howell. The towering centre-back, at 6’5” is one of the tallest players in National League. He played the final 20 minutes in Borough’s 3-0 win at Wealdstone and may well have a role against Billericay. Meanwhile Mike West has been loaned out to Tonbridge Angels for a month.